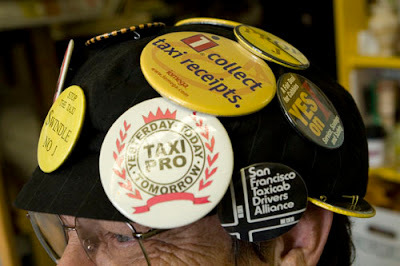 SF Taxi Media: SFMTA Ignoring Drivers' Safety? At Green Cab, Athan the manager, has on the Green website "expect the unexpected" [Heraclitus (c.535 BC - 475 BC]. You don't have to be a rocket scientist to know the holidays especially can be dangerous. Athan today copied Green Cab relaying an SFPD bulletin that there had been a robbery on a Yellow driver Dec 1 the other day. Would have been nice had they stated the time of the pick up and robbery. And on Jan 11 it will have been one year since driver Singh was stabbed on States Street. Nothing has been done. The way it is now your safety is largely a crap-shoot depending on your company and dispatch service. To some extent it involves big company v. little company. But really it's a worker protection issue and it shouldn't be a crap shoot. The SFMTA exists in part to provide uniform regulations including driver safety. I heard about this incident. Oftentimes it's thought that some places are more dangerous than others. Such as...the "bad" neighborhoods. Is this the case in S.F.? Are there places and times, say, where one has to be more alert than in other places and times? For danger to drivers, how does San Francisco compare to other comparable cities? Are Taxi drivers allowed to arm themselves? Got any tips about how to avoid being robbed?